“Fred” by Aaron Knight will make you smile. It is a funny book. Astro Robo Servant, Inc. has created the perfect six-armed robot that will clean your house, entertain you, cook for you and have a personality that matches your own. The robots cost thousands of dollars but they are designed to suit the wants and desires of each elite customer. These robots are a dream come true – that is until “Fred”. An angry employee has tinkered with “Fred” and programmed him to be antisocial and very shrewd. Sam Bass, aka SB, the founder of Astro Robo, is furious when he discovers that “Fred” is loose somewhere in New York City. SB sends Stanley, his not too favorite son-in-law/unsuccessful salesman to locate and unprogram the rebellious robot. Stanley’s wife, John and some Russian programmers also join in the escapades of locating “Fred”. The adventure that ensues will make you cheer on ‘Poor Stanley’ and laugh at ‘Crazy Fred’. Fred manages to escape each time his capture is near by disguising himself in costumes of Groucho Marx, an old-time gangster and Santa Claus that he has cleverly stolen. Aaron Knight will put your imagination into high gear with this book. 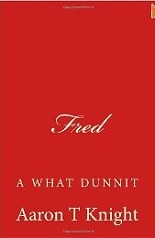 “Fred” offers the reader humor, romance, suspense and a lot of originality. “Fred” is a great book for all ages and all who enjoy a very funny look into the future world of living with robots. I really enjoyed reading this book and was sorry to turn the last page. It is a winner. For more reviews or to buy Fred from Amazon.com, click here.